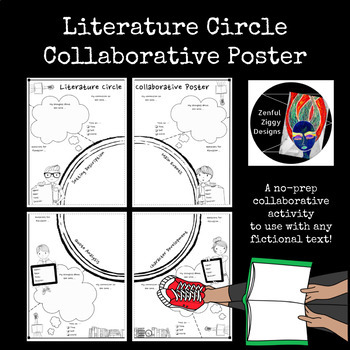 A perfect activity for literature circles and shared reading during your literacy block! Students work independently and in groups to analyze, respond to, and discuss fictional texts. Each student receives an 8.5” x 11” page, and contributes a different piece of information to the group's overall discussion of the text. 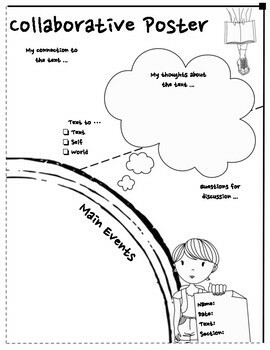 Roles can be rotated every chapter/section, or this activity can be completed after the students have read the entire text. 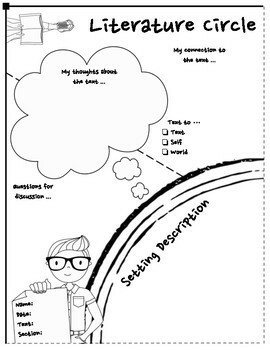 Setting Description- students draw and describe the setting (time/place). Main Events- students explain the main events of the plot. Character Development- students describe any growth/change in the characters. 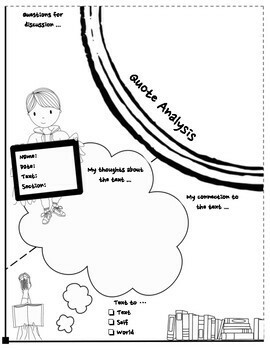 Quote Analysis- students select a quote and describe its importance in the text. To display their completed poster, students trim along the dotted edges and place their pages side by side on a background. By purchasing this resource, you are agreeing that the contents are the property of ZENFUL ZIGGY DESIGNS, and licensed to you only for classroom/personal use as a single user. I retain the copyright, and reserve all rights to this product. Please visit my store to purchase additional licenses for this product.